Pressure Cooker Hollywood Two-Tone Cheesecake is a simple, creamy cheesecake that uses just five basic ingredients. 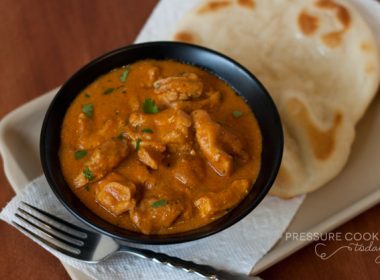 I’ve updated this 70-year-old recipe to make it work for today’s electric pressure cookers—but the classic taste remains just like mom and grandma used to make. 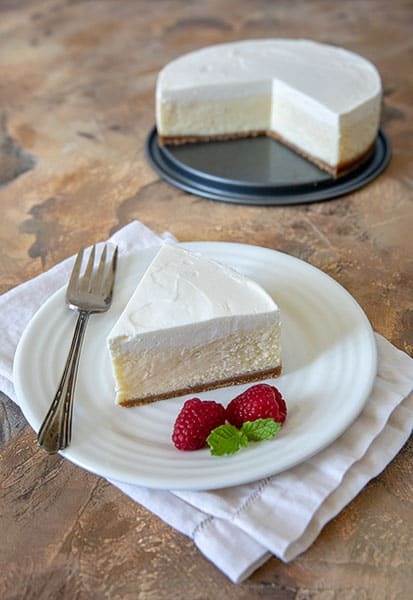 Sigrid, a long-time supporter of Pressure Cooking Today, recently sent me a traditional cheesecake recipe that Epicurious calls the best cheesecake recipe ever. 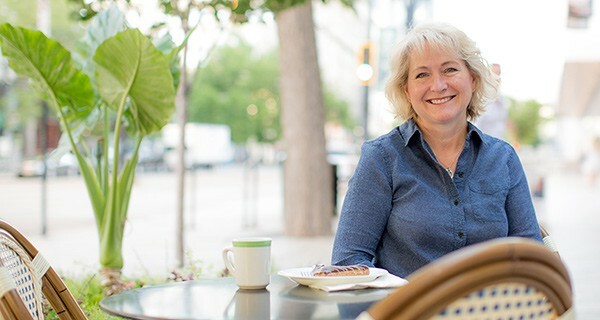 Sigrid calls it her all-time favorite cheesecake. It’s a very simple, classic cheesecake—just cream cheese, eggs, sugar and vanilla—dressed up with a sour cream topping. As soon as I saw it, I knew it would make a great addition to my collection of pressure cooker cheesecake recipes. I’m so glad that I get to share this classic with all of you! Epicurious sources this to an 1999 issue of Gourmet magazine, which traced it back to Santa Fe’s Three Cities of Spain coffeehouse in the 1970s. However, Sigrid says the recipe reminded her of a cheesecake her mom used to make called the Hollywood Two-Tone Cheesecake. I was curious, so I decided to dig a little deeper. Apparently the Hollywood Two-Tone Cheesecake was created by Antoinette Pope, who ran a successful cooking school and had her own cooking TV show in the 1950s and 60s. 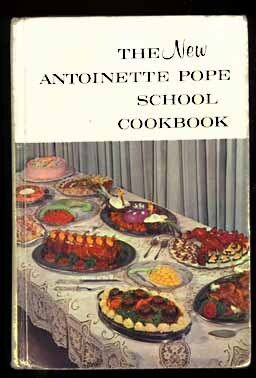 She also published a series of cookbooks starting in the 1940s through the early 70s. This cheesecake recipe was published in several editions of her cookbook. It seems to have made its way into Good Housekeeping and other magazines of the time and was passed from neighbor to neighbor. 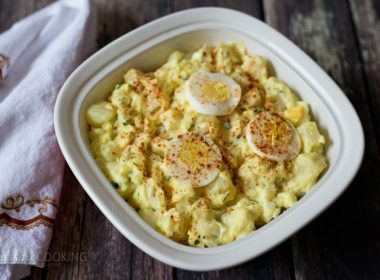 It’s just one of those recipes that takes people back in time when they taste it. It’s cheesecake just like mom (or grandma) used to make! Since the cheesecake itself has only four ingredients, be sure to follow the instructions carefully. Use room temperature ingredients. This will make such a difference in the smoothness of your finished cheesecake. You want to mix the cream cheese until it’s soft and smooth; however, you also need to be careful not to overwhip it. 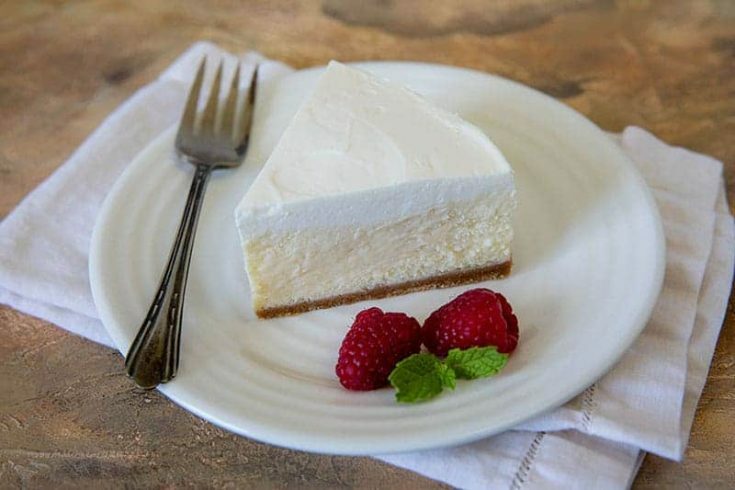 Overwhipped cheesecake can rise too much, which affects the texture and appearance. Also, as you mix, regularly scrape down the bowl to ensure the cream cheese, eggs, and sugar are evenly mixed. Also, don’t scrape the beater after mixing—the unbeaten cream cheese stuck to the beaters often adds lumps to your cheesecake batter. One of the unique things about this recipe is the double cook time. 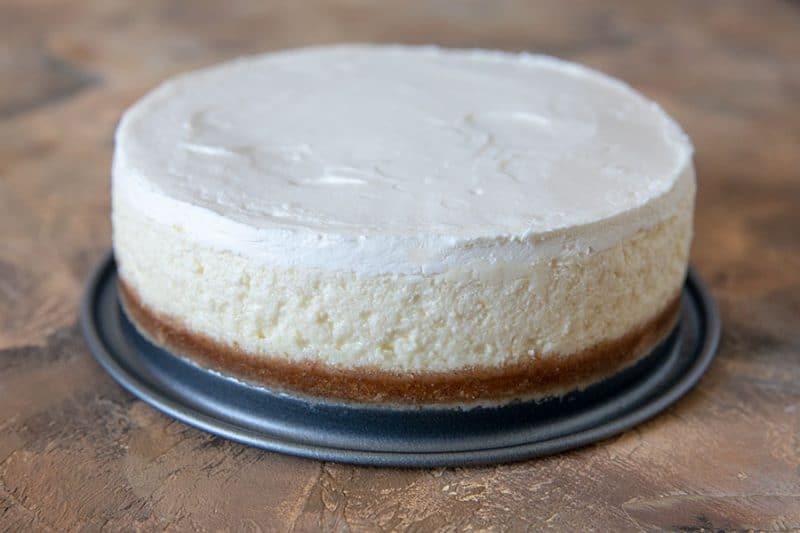 You place the cheesecake in the pressure cooker to “bake” the filling until it’s nearly set, then you remove it, add the topping, and return it to the pressure cooker briefly to set the topping. In this recipe, the cheesecake goes into the first bake uncovered. After you smooth on the sour cream topping, tightly cover the pan with aluminum foil before cooking. If you prefer, you can cover your cheesecake with foil for both the first and second bake, but you’ll need to increase the cook time on your first bake by a good amount. I’d start with 5 minutes, but it could take longer to get the middle above 140°F. If you’re still concerned, see more of my best cheesecake making tips here. Do you remember eating a cheesecake similar to the Hollywood Two-Tone Cheesecake growing up? I’d love to hear from you! As always, let me know what you think! 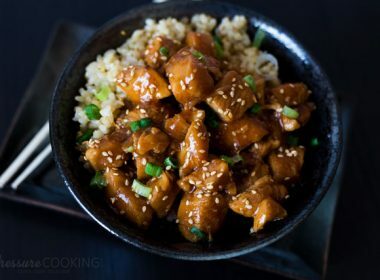 I’d love to see pictures and comments about your recipe successes in the comments or on my Facebook page! 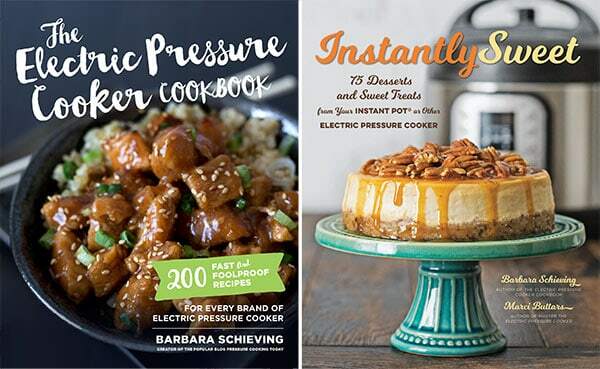 Do you have a recipe you think would make a great pressure cooker recipe? Please send them to me—I love getting suggestions from my readers! 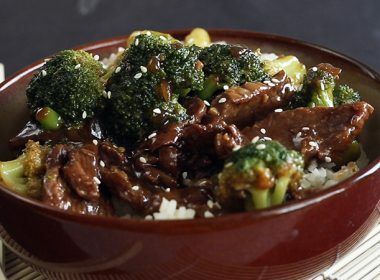 I keep a few slots on my calendar open to add in reader-favorite recipes. Thanks Sigrid for suggesting I turn the Hollywood Two-Tone Cheesecake into a pressure cooker cheesecake. It was a hit with my family. I’m sure it will be a favorite for your family too. 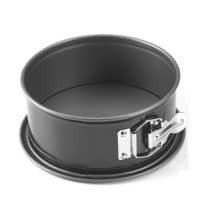 Prepare a 7-inch springform pan by coating it with nonstick baking spray with flour. Line with parchment paper if desired. In a small bowl, combine the graham cracker crumbs, butter, and cinnamon (if using). Use a tamper or round glass to press the crumbs firmly in the bottom of the pan and, if desired, 1-inch up the side of the pan. Place in the freezer for 10 minutes. In a mixing bowl, beat the cream cheese at medium speed until fluffy, about 1 to 2 minutes. Mix in eggs and egg yolk one at a time just until blended. Add vanilla and sugar and beat until just blended. Be careful not to over mix! Pour batter the on top of the crust. 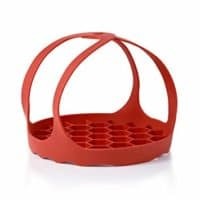 Pour 1 cup of water into the pressure cooking pot and place the trivet in the bottom. Carefully center the filled, uncovered pan on a sling and lower it into the pressure cooking pot. Fold the foil sling down so that it doesn’t interfere with closing the lid. Lock the lid in place. Select High Pressure and set the timer for 22 minutes. While the cheesecake is cooking, prepare the topping. In a medium bowl, mix sour cream, sugar, and vanilla, and stir until well combined. Set aside. Use the corner of a paper towel to soak up any water that may have condensed on top of the cheesecake. 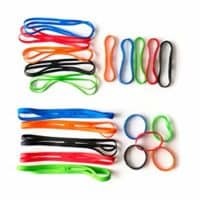 Let stand for 5 minutes on the wire rack. After 5 minutes, drop even spoonfuls of the sour cream topping around edge of cheesecake. Use an offset spatula or a spoon to gently spread the topping evenly over the center. Cover the pan tightly with aluminum foil. Use the sling to return the cheesecake to the pressure cooking pot. Lock lid in place. Select High Pressure and 5 minutes cook time. 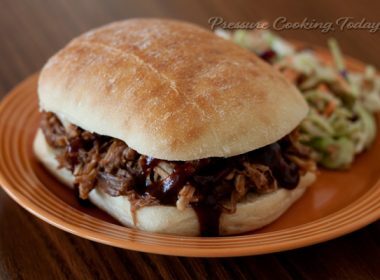 When the cook time ends, allow the pressure to release naturally for 10 minutes, then use a quick pressure release. Use the foil sling to remove the springform pan to a wire rack to cool. Remove the foil covering and use the corner of a paper towel to soak up any water that may have condensed on top of the cheesecake. When cheesecake is cooled, cover with plastic wrap and refrigerate for at least 4 hours or overnight. 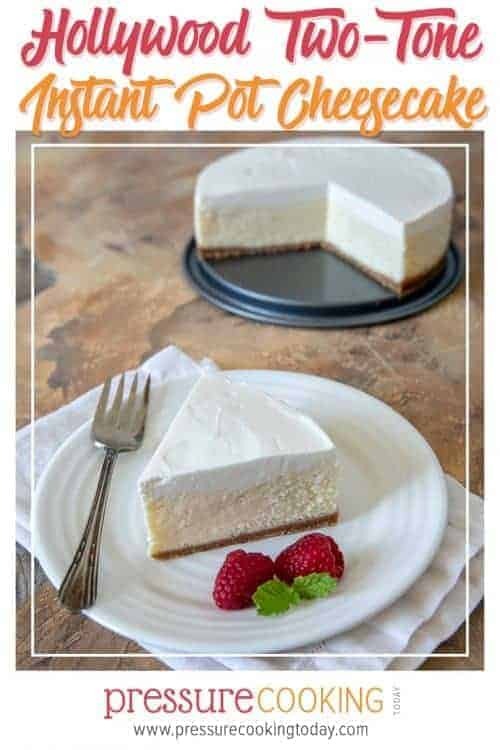 If you want to maintain more of a contrast between the cheesecake and the sour cream topping, use traditional vanilla in the cheesecake and a clear imitation vanilla in the sour cream filling. You can find the clear vanilla in specialty baking stores and many craft stores.